Less then 10 miles outside San Antonio, on Stinson Mun'l Airport, I visited this museum on Nov.18th. Again quite a different museum than the previous, adressing early aviation (a lot of it in relation to Texas and/or San Antonio) and housing some remarkable exhibits. This airfield openened to aviation in 1915 and the Stinson family operated a flying school. Katherine Stinson was the fourth licensed pilot in the country and a replica of her Blériot XI can be seen. Exhibits also relate to nearby historic airfields such as Kelly Field and Brooks AFB. Since 1999, the Texas Air Museum at Stinson Field has been dedicated to telling the story of Texas and San Antonio's vital role in the developement of military air power. 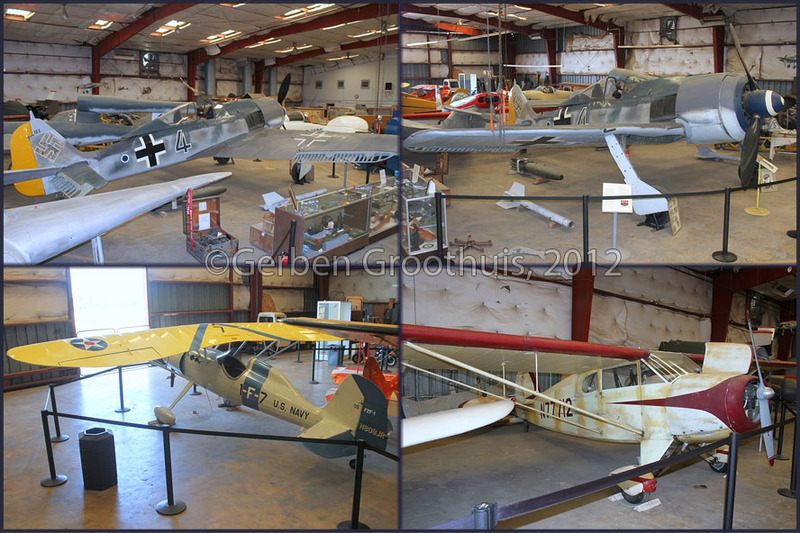 Note: The German Focke-Wulf Fw 190A (732183/4) is no longer on display here; it went to the Military Aviation Museum in Pungo,VA; associated with that museum is an aircraft restoration and maintenance organization, called The Fighter Factory - so this famous WWII may yet fly again one day. (A 2012 image added at bottom page). open mind I think you will be pleasantly surprised. Mind, there is another Texas Air Museum ('Caprock Chapter') near Lubbock. There is (or was) also a chapter at Rio Hondo (nr Harlingen)? early aviation history here in the area. early Texan aviation is explained here. Airplanes were also used by the United States Army against Pancho Villa. flying those 'wire & wood' crates, exchanging pistol shots... Weird! Displays tracing the history of the airport and local aviation can keep you browsing for quite a while here. Brooks Air Force Base is a closed United States Air Force facility, located in San Antonio,TX. It was closed on 30Sep2011. It was one of 32 Air Service, US Army training camps established in 1918 after the United States entry into WWI, being established on 08Dec1917 as Kelly Field No. 5. Flying at Brooks, however predates its military establishment, as the facility was known as Gosport Field prior to the first Army airplanes arriving on 05Dec 1917. During the late 1950s, Brooks was transformed from a flying training center to a center for modern medical research and development and education center. The transition started in the summer of 1959 when the School of Aviation Medicine returned to Brooks from Randolph AFB. An era in aviation history ended on 20Jun1960, when the last plane took off from Brooks. The aircraft was a C-131 'Samaritan', piloted by Col. L.B. Matthews, commander of Det. 1, 1st Aeromedical Transport Group. "President John F. Kennedy dedicated the School of Aerospace Medicine on 21Nov1963, the day before he was assassinated in Dallas. This was Kennedy's last official act as president!" The Kennedy room; the link with this museum and Brooks AFB is explained above. Not sure why this display on the Berlin Airlift is here, except it was a remarkable event in aviation history. Just an image I noticed on the wall in the museum; I think this is a Beech AT-11 Kansan. Various aircraft kit models, bombers & transports. The information with the exhibits is rather sparse at times. were flown in or into Laos on CIA's covert operations. Formed by William H. Bird as a CIA proprietary company. Ceased ops in 1965, to form Continental AS. Restarted in 1975 to succeed Air America, providing contract air services in Laos. character of the American pilot-of-fortune Dwight Schafter, in Nevil Shute's 'Round the Bend'." These may be mistaken for Douglas DC-3's, but are Curtiss C-46 Commando's. Also a photo from a photo in the museum. That symbol on the tail may refer to Kris Air..? See info further below! The location is probably Singapore-Seletar. N335CA was pictured at SIN Oct.1980. Photo Collection M. Gilliand, via ATDB.aero"
I would welcome more info on Kris Air; were they ever involved with CIA's covert air operations? Steve Ozel wrote: ".. have you read Paul Howard's 'Mercy Angels of Angkor' article from a few years ago? This has details of these C-46's!" Googling I found this may have been published in a 2006 issue of Air Enthusiast magazine. Details will be advsised! This was written on Geoff Goodall's website (LINK), where he shares his "..photographs (taken) at Seletar Airport, Singapore and Denpasar Airport, Bali during July 1980". Geoff includes the following info:"This advertisement in Asia Plane magazine was the genesis of Kris Air. As the American involvement in the SE Asian hostilities wound down in 1975, Continental Air Services Inc (CASI) C-46s N335CA, N336CA, N337CA were ferried to Seletar. They were acquired by the colourful American-backed Tri-9 Corp at Seletar and used on oil industry freight charters, adopting a new paint scheme with sea horse motif. When Tri-9 finished up in 1977, the newly-formed Kris Air acquired the three C-46s in a deal that included Tri-9's operating authorities and freight contracts." So the B&W pic is probably Kris Air #1 and the colour(ful) C-46 is probably Kris Air #2! Steve Darke forwarded me a 2005 article published in Air Enthusiast, titled 'Mercy Angels of Angkor', written by Paul Howard. Unfortunately the article scanned in Acrobat Reader .pdf format is weak in contrast, but the content is a fascinating read! And it does contain some detail of use of N335CA and N336CA. While the caption does not plead for the thoroughness of the article, the content offers a huge amount of information concerning the 1973-1975 Phnom Penh Airlift and operaros involved. "Mercy Angels of Angkor - the Phnom Penh Airlift, 1973 to 1975." Paul Howard describes in a wonderfully detailed air Enthusiastic article how "..over 100 classic airliners flown by 30 or more carriers - both established and less orthodox - took a direct part in this mission of mercy." "Following peace in Vietnam and the effect of a cease-fire in Laos, a number of veteran 'propliners' came to the fore in the Khmer Republic, owned, leased and operated by equality well-worn North American expatriate entrepeneurs who ran South East Asia Air Transport (SEAAT), International Air and Tri-9 Corp. These enterprises had all been comfortably established in the region's leasing business since 1970 and had consolidated their respective fleets back at West Camp on the discreet Seletar airfield in Singapore." They ".. took the opportunity to enlarge their fleets and buy up additional tired prop transports from 'boneyards' on Mainland USA and around the Australasian region ... used for sub-lease or resell at 'interesting' rates to the new operators springing up in the Khmer Republic." "Oddly enough, despite the conditions, the influx of pilots content to continue working in SE Asia after the Vietnam conflict was initially higher than the number of aircraft available for them to fly! Many were ex-employees of Air America (AAM) and Continental Air Services Inc (CASI), both former large contract operators involved in SEA now winding down in the postwar environment." 'By 1973, the renamed Air Cambodge (March 1971, formerly Royal Air Cambodge - RAC) the government controled national carrier, was still suffering from ongoing neglect and .. corruption .. The government was forced to authorize Khmer Airlines ... the second airlines officially able to carry revenue passengers." "..Robert 'Big Bob' Ferguson who, with Jack 'You've-Got-the-Wrong-Guy' Garfinkle of Tarzana,CA and Vice President Operations 'Stealth' (Cecil) Wroten operated South East Asia Air Transport (SEAAT), with an inventory of run-down Douglas DC-3s, DC-4s and the somewhat sophistocated and costly Consolidated Convair Liners. "SEAAT lease deals to Air Cambodge kept it airborne and included examples of the above, plus an Aviation Traders Carvair, all US-registered and flown by pilots who held FAA lincences." "China Airlines (CAL) of Taiwan was another source of equipment for Air Cambodge, leasing DC-4s...at various intervals. This was before SEAAT undercut them with its own DC-4s." 'A further source for Air Cambodge was the TRI-9 Corp, steered by another American expatriate 'Captain' Jim Ziegler, who supplied .. US-registered Convair Liners, filtered through Broker Alliance." "Associated with these outfits was the incorrigible 'Stan the Man' - Stanley Booker of Stan Airplane Sales (of Fresno,CA), with Don Douglas, chief pilot of Stan's local venture, International Air." "Booker was well known in the Australasian region, having supplied Cessna 310s to the Indonesian Air Force. He bought several former RAAF Douglas C-47s cheaply, and used some to set up Sempati Airlines of Indonesia." "The Republics' serviceable aircraft inventory, however, only totalled around 40 odd machines, far too few to satisfy the growing internal demand..." "The government reluctantly invited additional foreign (independent) air operators... with the proviso that a registered Khmer company was 'fronted' and a visible Khmeridenity maintained (flag and title, but not necessarily national markings)." CASI... flown contracts around Indochina since the mid-1960s, had early expanded into the Khmer Republic. It created a subsidiary named Khmer Akas, using Convair Liners supplied by Jim Ziegler.."
'However, it was not long before CASI, a professionally-run operation ... refused to allow its subsidiary to accept bureaucracy, graft and corruption then existing in the Republic." "Khmer Akas ceased operations following the tragic loss of DC-3 XW-PKY at Kampot. Trading off the subsidiary and some DC-3s to Khmer Hansa, a rejuvenated local operator, several aircraft found their way back to continue on the airlift in new liveries, while the Convairs were returned to TRI-9. However CASI maintained a presence via untitled C-46 N337CA, which flew 'embassy' shuttles to and from Phnom Penh out of U-tapao,Thailand until spring 1975." Following Khmer Akas' withdrawal, the Chinese connection ... filled the void, via the enigmatic captain Liao Chain Ming ('Jimmy' Liao)". He set about expanding the Cambodia Air Commercial (CAC) company (in which he had a funding stake), the operating arm (in the Republic) of Air Union, Laos with a fleet ... Laotian-registered DC-3s, plus a trio of C-46s and the rare Boeing SA-307 Stratoliners (two:XW-TFP and XW-TFR). 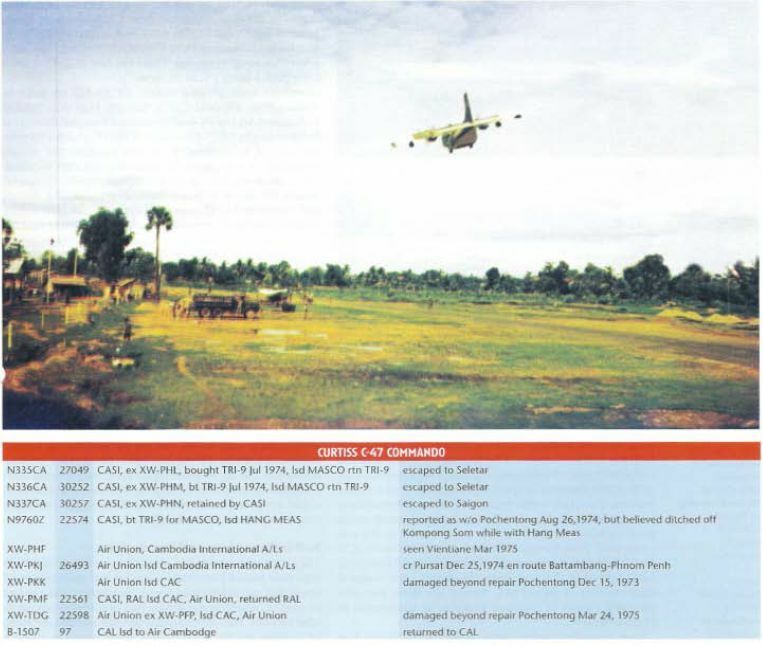 CAC rapidly became one of the busiest independent operators on Phnom Penh's Pochentong (Bao Cheng Tong) airfield." "The majority of aircraft flying the airlift carried Laotian or US registrations." "The sizeable contingent of Chinese pilots held Taiwanese licences which enabled them to fly their own 'B..'-registered aircraft." Because of bureaucracy involved, only around 14% of the aircraft capacity overall was actually registered in the Khmer Republic (XU-...)." "..included 2 Air Cambodge DC-4s, its longs-erving DC-6B, plus a DC-3 and Khmer A/L fleet of DC-3s. Largest of the remaining carriers was KHmer Hansa, ... flew seven DC-3s (XU-DAG, XU-EAH, XU-FAI, XU-GAJ, XU-HAK, XU-IAL, XU-LAN) and Soraya A/L with V. Viscount 768D XU-LAM and a pair of DC-3s, the latter registered in Laos." "Meanwhile, Jim Ziegler's TRI-9 Corp... was supplying Convair Liners in the Republic." "..he acquired former Indonesian examples, re-registering them with US-marks, and, after performing limited maintenance at his Seletar base, put them on line." 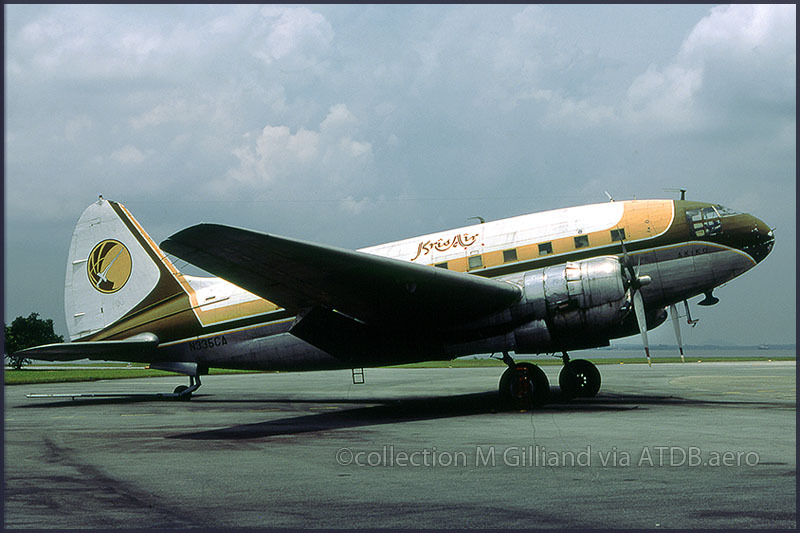 "Ziegler also ... acquired ex/CASI C-46 N9760Z.. which was reported soon afterwards written off on the apron of Pochentong (It was also reported as ditched in the Gulf of Siam, off Kompong Som, the former Sihanoukville)." "The Khmer Rouge overran the centre of Phnom Penh and April 16th. Most of the loyal airport staff that remained perished in the bloodbath that followed occupation." "After the fall of the Khmer Republic, many of the aircraft that escaped were seized by creditors: some never flew - or moved - again, or else were scrapped where they stood. By the end of that April, South Vietnam had also fallen, and later in the year, Laos, the final domino in the game, capitulated, bringing the end of Indochina." The article (in 2 parts) identifies and deals with a large variety of 'propliners' such as the Big Dougs, the inevitable DC-3s, but also a Boeing SA-307 and an ATL.98 Carvair (nicknamed the 'Polish 747'). The size of the article makes it impossible to continue highlighting the main developments because there are too many. While this .pdf document is not easy to read I would certainly recommend an attempt. "John Lear was a pilot for Continental Air Services, Inc. (CASI), a Subsidiary of Continental Air Lines which was in existence from 1965 to 1975. It was formed in April 1965 by Continental Airlines at the suggestion of the United States Government. The objective was to provide a "less visible" air transport alternative to the CIA associated 'Air America' for the growing Laotian support." Why make it clear flying was done "..mostly in Indonesia"? While (some of) the documents also showed Laos. he flew?). And continued his career there (with Ziegler's TRI-9 Corp?). Curtiss Model D Pusher (replica) ; it does seem to lack an engine. My report of my visit to the Western Antique Aeroplane and Automobile Museum (WAAAM) shows one more complete. The Christofferson 'headless pusher' biplane; the history below of the first ever dogfight relates to it. The Christofferson company was established in Washington State, in 1910 by Harry & Silas Christofferson. They moved to California in 1912 and registerd as (Goodsell, Harry, Harvey & Silas) Christofferson Aviation Company Inc., 1417 Van Ness Blvd, San Francisco. Manufacturing ceased to after the death of Silas Christofferson on 31Oct1916. In 1918 the interests were sold to United States Aircraft Corp., after Goodsell Christofferson was killed in a flying accident. He wasn't the last of that family to die in an aviation accident: Harvey went into flight instruction and was killed in a crash in May 1927. A number of designs were produced and the Mexican Army ordered a few; see below 'armed aerial combat'! The first ever dogfight over the American continent! Katherine Stinson's Bleriot XI (replica); note how simple that wing is constructed, but obviously with a clear design in mind. The lady at the controls! Katherine Stinson was the fourth woman in the United States to obtain a pilot's certificate. She earned her pilot's certificate on 24Jul1912, at the age of 21. Katherine had planned to get her certificate and use money she earned from exhibition flying to pay for... her music lessons! However, she found she liked flying so much that she gave up her piano career and decided to become an aviator. Since she appeared younger, while on the exhibition circuit, she was known as the 'Flying Schoolgirl'. On 18Jul1915 Stinson became the first woman to perform a loop, at Cicero Field in Chicago, IL and went on to perform this feat some 500 times without a single accident. On 11Dec1917, Katherine Stinson flew 606 miles from San Diego to San Francisco, setting a new American non-stop distance record. In Europe she contracted influenza, which turned into tuberculosis in 1920, causing her retirement from aviation. She died in 1977 at the age of 86. AVRO (A.V. Roe) Tri-Plane (replica); the Mk.IV was used as a trainer at Brooklands Airfield in England. Boeing P-26A, obviously a replica and probably not to scale. Former Kelly Air Force Base is a US Air Force facility located in San Antonio,TX. In 2001, the former Kelly AFB runway and land west of the runway became 'Kelly Field Annex' and control of this reduced size installation was transferred to the adjacent Lackland Air Force Base, part of Joint Base San Antonio. officers and engineers; a mechanics school and as an aviation general supply depot. Home-built, this Pietenpol Aircamper (or 'Air Camper') was manufactured in 1968, by Robert Nortcutt. The first prototype that became the Air Camper was actually built and flown, by Pietenpol, in 1928! later the Waco Aircraft Company. First flight: 1927; production ran 1927-1933. I had a hard time trying to find its identity, but Terry Fletcher spotted the clue! The Howard Aircraft Corporation was a small USA aircraft manufacturer in the 1930s and 1940s. The factory was initially on the south side of Chicago Municipal Airport at 5301 W. 65th Street; during World War II a second plant was opened at DuPage Airport west of Chicago. The Howard DGA-8, DGA-9, DGA-11, and DGA-12 were a family of four-place, single-engine, high-wing light monoplanes built by the Howard Aircraft Corporation, Chicago, Illinois from 1936. UC-70 - DGA-8/ -9/ -12 and -15 aircraft impressed into service with the USAAC as utility transports. In 1939, the Howard Aircraft Corporation produced a new development of the basic design, the DGA-15. It was available in several versions, differing in the engine fitted. The DGA-15P was powered by a Pratt & Whitney Wasp Junior radial engine, while the DGA-15J used a Jacobs L6MB and the DGA-15W a Wright R-760-E2 Whirlwind. In an era when airlines were flying Douglas DC-3s, the Howards cruising at 160 to 170 mph could match their speed, range and comfort with the rear seat leg room exceeding airline standards with limousine-like capaciousness, and high wing loading allowing the Howards to ride through most turbulence comfortably. Prior to the attack on Pearl Harbor in December 1941, about 80 DGA-8 through -15 aircraft had been built at the Howard Aircraft Corporation factory on the south side of Chicago Municipal Airport. With America's entry into WWII, most of the civilian Howards were commandeered by the military. The Army used them as officer transports and as air ambulances, with the designation UC-70. The Navy, in particular, much liked the aircraft and contracted Howard Aircraft Corporation to build hundreds of DGA-15Ps to its own specifications. They were used variously under several designations as an officers' utility transport (GH-1, GH-3), aerial ambulance (GH-2), and for instrument training (NH-1). So much for the history of this type Howard DGA-15/GH-3, now for the identity of this particular airframe! Intially I found a San Antonio registered Howard DGA-15P as a candidate: N2737. Joe Baugher has "Howard GH-3 Nightingale BuNo.45049 (MSN 1020), current as N2737"
But on the FAA N-inquiry website I found it still reg'd to Keeling Mclin of San Antonio... So indeed 'current'. Terry Fletcher wrote me in Dec.2015: "With regard to your Howard Nightingale query - I followed the lead on the sign in front of the aircraft , namely 'From USS Lexington'! for amateur construction by Aircraft Spruce & Specialty of Corona, California. By 1998, the company reported that 35 aircraft were completed and flying. The Funk Model B was a 1930s American 2-seat cabin monoplane designed by Howard and Joe Funk. Originally built by the Akron Aircraft Company, later renamed Funk Aircraft Company. Spinks Akromaster N31SA; c/n S-1 (1968) is a unique aircraft. 'Pappy' Spinks provided the funding, and name, to Charlie Hillard for the creation of the Akromaster. During certification testing of the cabin version of the Akromaster, aerobatic pilot Harold Krier was unable to recover from a flat spin and died due to a parachute malfunction! Charlie Hillard flew the Akromaster prior to forming the Red Devils aerobatic team. Hillard placed third in the 1970 world aerobatic championships with the aircraft. A number of flight simulaters plus, something obviously lacking in simulators: an ejection seat (F-4 Phantom fighter jet). "The pilot/builder/designer was attempting to fly the airplane on its maiden test flight. During the takeoff roll, the pilot lifted the airplane's nose wheel off the runway two or three times, then the airplane lifted off the runway and climbed to an altitude approximately one half of the airplane's wingspan. The airplane immediately returned to the runway in a porpoise like motion and lifted off a second time with a hard right roll. The airplane then impacted the runway in an inverted position. Postaccident examination revealed the rudder exhibited crushed areas at the bottom and top. The top crushed area matched dimensionally to the four-belt driven wheel which turned the airplane's propeller. A test pilot reported that during previous high speed taxi runs, conducted in August 1987, he had to apply 'stop-to-stop' elevator stick movements to maintain a steady pitch attitude. A review of the video tape of the taxi tests revealed that the elevator was moving in what appeared to be 'stop-to-stop' movements. CAUSE: inadequate design by the pilot/builder/designer. Related factors were: the porpoise that was encountered by the pilot during the takeoff, and the subsequent jammed rudder." A pity to see this Northrop EF-89B Scorpion (49-2434) in such a sad state because you don't come across them often. was retained by the USAF, because it was a one-off model. It is the oldest surviving F-89!" A warning was issued to us, stepping outside, to watch for yellowjackets, big wasps. They nest on this aircraft. I also found a Republic F-105F Thunderchief (63-8363) listed with his museum, but it was not present upon my visit. See below images by Gerben Groothuis. Gerben Groothuis also visited this museum, in August 2012. That Focke-Wulf Fw190 was still there then.